Kerri ní Dochartaigh is a writer who grew up during the Troubles that ravaged Ireland. She lives in a very northwesterly part of the island, where the sky is grey and unbearably beautiful. 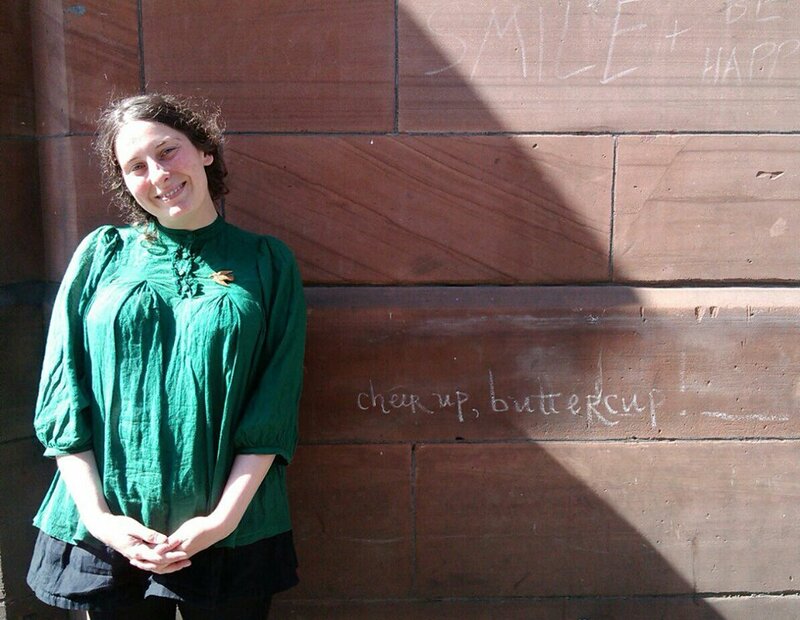 She writes about nature, literature, place, beauty, grieving and healing. She writes at her kitchen table with the back door open; even when it snows. In 2016 she won a writing competition on this blog with this beautiful piece. Once, many moons ago, just before I turned 28, I sat in a Classroom in Edinburgh and learned things about the moon that filled me with a sense of wonder I only ever remember experiencing as a very young child. Phrases I had heard before but never dared to admit I didn’t understand were given to me with such clarity that, like that glorious Luna, they began to shine with simplicity and real meaning. Phases and cycles were broken down for me into imagery that somehow shapeshifted, and suddenly became so relevant and personal to me, no matter how high up and far away in the sky the moon hung. Apogee and perigee, waxing and waning, gibbous and crescent- however, the term that seemed to me the most relevant phase of all in that moment of such freshly gifted knowledge was ‘new moon’; freshly born and full of promise. The lecturer then gave us perhaps the oddest homework task I have ever been given: to go home and find out what stage the moon had been at the moment we came into this world. Now, much as we may bash the internet and its time-stealing, rabbit-hole like ways; I felt fairly grateful for it that night as I gazed on my screen at the moon phases of December 1983 in all their ordered, rhythmical splendour. I was born on a waning crescent moon. I could see how the moon would have looked on the night my Mamma brought her first child into the world, and, most intriguingly for me, I could see how the moon looked on the very first day of the newly born year of that same week. On New Year’s Day of 1984, less than a handful of days for me into this wondrous journey of being alive, the moon that graced our Mid-Winter sky was a waning crescent in its very last stage of being visible to the eye, that one that looks like it’s been drawn onto the page by a young child; full of whispered delicacy. For my whole life, my favourite moon phase has been this one, and my favourite day of the year is the very first one; New Year’s Day. When things such as these come together by chance, hand in hand, it brings the type of joy to me that a murmuration of starlings does; so seemingly ordinary in many ways and yet so full of a sense of ethereal grace. This New Year’s Day, after awakening on my first New Year’s Day as a non-drinker, after being heralded into my first swim of the year in the Atlantic Ocean by a curfew of curlew at Shroove Lighthouse – I began to make my way through Mary Colwell’s ‘Curlew Moon’. ‘Curlew Moon’ is well placed in that line of Nature Memoir that we have been so enjoying over the last few years, and will settle in on the shelves so beautifully alongside Helen MacDonald’s ‘H is for Hawk’, Amy Liptrot’s ‘The Outrun’ and Alys Fowler’s ‘Hidden Nature’ to name just a few. Our desire as a general public to know both ourselves and our world deeper- more truly-is rising like the new moon on a winter’s morning, and I am confident that this means something; this is the makings of a story of great sea change a-coming. The first time I heard the cry of a curlew after reading those words was on Inch Island whilst walking with my Father through tall reeds under a beautiful winter sky filled with starlings. Less than a minute after the curlew broke that December silence, my Father told me, for the first time, that he had almost drowned when he was 18 after being caught up in reeds beside a swan’s nest. He never explained why, all out of no place at all, he chose that particular moment to share such a traumatising part of the story of his life; a life that, due to his leaving when I was so young, I then knew very little about. To this day I believe that the thing that swept away decades of distance, and which caught my Father so off guard; that which made him so honest and brave, was that curlew’s cry in the soft, pink December sky. I imagine that many, many people who read these words will have their own personal experience with the curlew brought to the surface of their very being too; an emotional call to arms on behalf of a bird that so much deserves our support. By the time my Father and I had reached the water’s edge after we shared our first curlew experience, where our bodies met the outline of the world, where the waves met the land; a brand new page had been added to our shared story. There are as many, if not more, types of nature lovers as there are phases of the moon. This book brings together the stories of many everyday folk trying their best to do well by a bird we are dangerously at risk of losing to the realm of folklore. A wonder of our natural world that could so easily be dragged down deep into the darkened chambers of an underworld created-not by some god- but by us through our own actions; rather- through our inaction. I have the feeling that this book did not make for easy writing, and, for me, it did not make for easy reading. This statement, however, is a compliment to its brave, honest writer. There can be no quick or easy fix to our Curlew story. Like all important stories, the threads often seem too tangled to even begin to try to unravel them so that one may find the heart of it; one may find the core. I am grateful to my core though that Colwell embarked on her journey, one that she whispered to us from the onset ‘would be a journey of many layers.’ As with all good writing, an imprint has been left on me as the reader through the act of reading this book; there is a brand new, freshly formed pathway on my insides. One that, each time I return to this book (as I know I shall), will grow deeper through being traversed over and over, and come at with fresh experiences; like Richard Long’s lines made by walking, the Holloway Robert MacFarlane documented in memory of his friend Roger Deakin or like the lines on a loved one’s face as we grow to know them through more and more Winters. Colwell’s journey from the West of Ireland to the furthermost stretches of England’s Eastern coast has directly impacted on my own journey with this new moon bird; my favourite creature of all. She recounts conversations with people from many walks of life, and goes into many different details about the curlew- throughout History, in Literature, Scientifically and more. Some sections of the book sang out more for me than others, naturally. I was particularly drawn to Colwell’s own inner journey on her Mother’s soil but I feel each reader would glean gold from a variety of places in this book. The curlew journey for Colwell was a journey with her grief, with her history, with her world and with her own self. The reading of it, for me, echoed all these things and allowed my own journey with each of these to rise to the surface in turn. If you are a lover of the curlew, of the world, or merely if you are alive; I think you should read this book. You will be changed by it, maybe in ways that take years to surface. Like how that first sliver of a freshly born new moon never fails to return to our crow black sky, there is still hope left for the curlew. It may feel so often to be the faintest, most hushed whisper of hope but there is sound still there; we are not yet suffocated by silence. I have shared more words about this beautiful, almost other-worldly bird in the month that has just gone by than I have in all the months that went before it combined. I have given advice to a sheep farmer in County Down who, in fear of what Brexit may hold for him as an exporter, is considering planting trees on all of his land. I have begged him to read this book before he makes any decisions, and something about the look in his eyes made me trust that he would. I have spoken with a dear friend, also born here in Doire-Derry-Londonderry, who makes music and is a lover of sound, asking if he has heard a curlew cry. I know that he will listen to one online, and I know that it will impact on him; who knows to what degree. I have talked with a four-year old boy in a bird hide on Inch Island in Donegal, moments after we’d been left alone to witness our bird wading in the silt while his Father calmed down his wailing wee sister outside. As I showed him which bird ours was on the colourful information sign, a parcel of oystercatchers filled the grey sky and he grinned from ear to ear. Naming things and speaking that name gives us a sense of connectedness; exactly what is needed for us to stand up and raise our voices on their behalf. This book is directly responsible for that break in my own silence; that move out of a bog-land of fear and helplessness towards a reawakened call to action. I began with a desire to write a book review and have realised that this is not really that. Rather- it is, in actual fact, a letter of deepest, most warm-hearted thanks. Like the curlews on Inch Island, and indeed those in all the safe spaces that they still have across Éire, Alba, Cymru and England; we are still here. As long as that is the case, we hold the power to change the story both we and the curlew are living by. There are enough of us left that will not allow the haunting, soul-soothing call of the curlew to leave our soundscapes. There are enough of us left that will continue to name our curlews, to shout out on their behalf; to sing a story of hope above the cacophony of sorrow. There are enough of us that will not be silenced. There are enough of us. There are enough of us. 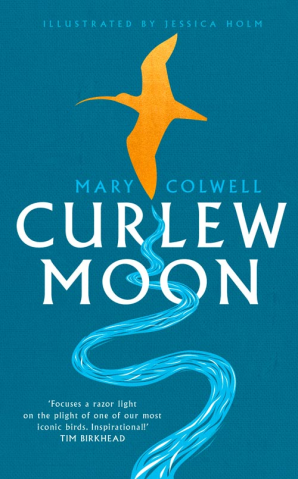 Curlew Moon by Mary Colwell is published by William Collins. These latest guest blogs are inspirational. Thanks to the contributors, and Mark, of course. They join a long line of wonderful guest blogs. Thank you, Kerri - this is wonderful - it made me cry actually. buy Mary's book, it seems to have inspired so many people. She recently had published an interesting article, in the Shooting Times, concerning the possible effects of re- renewable energy structures on wildlife ( including Curlews of course ), the girl gets about a bit. The Curlew, especially its calls, has obviously had a profound influence on you also, Kerri. you cross its territory in the spring, or on an autumn estuary. marvellous bird has a future. Yes, I really love that Mary brings her knowledge and passion to such a wide and varied audience; part of the work we all need to do is to widen our circle of influence in order to conserve that which we simply must not lose. Indeed, what a truly ‘marvellous’ bird: inspiring each and every one of us. Thanks Kerri, I loved everything about you blog, it spoke on many levels and a great plea for the curlew and its right to exist. Must buy the book now. Splendid blog - thank you Kerri. I was born on a waxing gibbous moon. Not a sentence I ever expected to write (or something I'd ever thought of) until today! I was lucky enough to spend a few days on Mull in September and although obviously the female Hen Harrier and the pair of White-tailed Eagles were exciting it's the call of the curlews before first light where we were camping that I remember as vividly as anything else. I hope you are right: I hope there are enough of us. Barry Thankyou for these kind, heartfelt words. What a special bird. Francis Thankyou for these words. Mull is a place so very dear to my heart, in particular Treshnish. I saw my first snow bunting there and it changed my life. Nature is such a healing, nourishing joy.